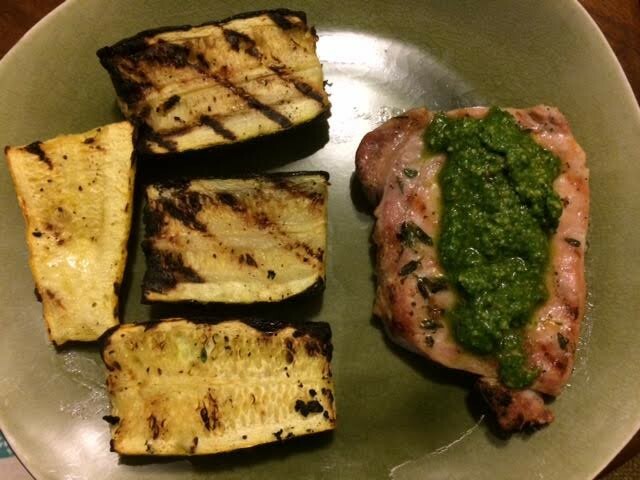 Herb Rubbed Pork Chops with Pesto | Om nom nom! In a mortar and pestle, mash together the thyme leaves, 1 teaspoon salt, 1 clove of garlic, and a several grinds of black pepper (alternatively, chop everything finely on a cutting board). Once pulped into a paste, add the lemon zest and 1 tablespoon of the olive oil and stir well. Rub the mixture onto the pork chops and let them rest for 10-15 minutes. Preheat a grill (or grill pan if indoors) over medium heat, then add the pork chops. Cook about 7 minutes on each side, then remove from the heat and allow to rest, then spoon the pesto over them and serve.